Easter break in school – 2 weeks of bliss from the daily routine of school and activities. Best time to plan a good getaway from the madness and crowd, and yet for some unfathomable reason, we chose to go Macau. 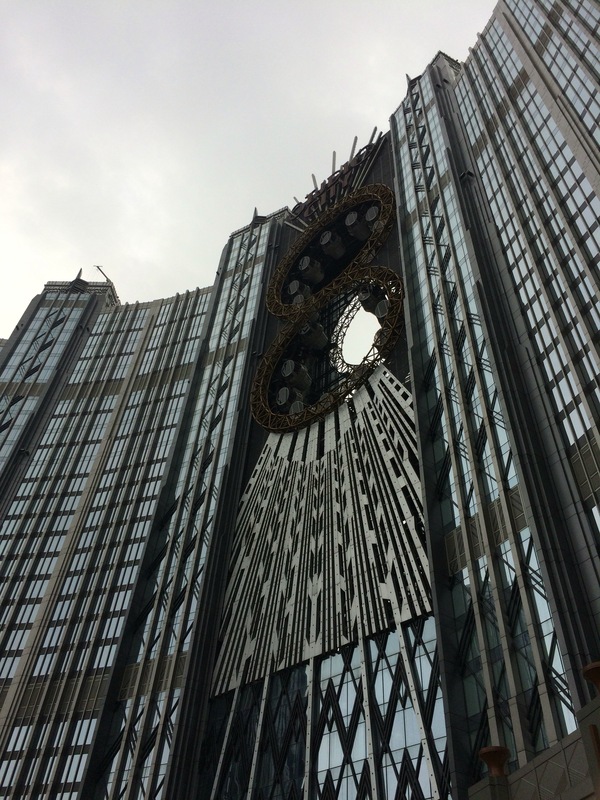 One tends to forget that Macau is nothing but an extension of Hong Kong. Same weather, same language (with a hint of Portuguese), same culture. Well we did know all of that but were looking for just a slight change of scene – beautiful hotel, pampered service, some new activities for the kids. Just three days to refresh ourselves! That’s the reason I chose Studio City – a brand new hotel designed on the theme of Hollywood movies and marketed as Asia’s leading entertainment destination. No more research needed. The hotel was booked by me directly via email. So with stars in my eyes having booked one of the top categories of room in this brand new flashy hotel, I was expecting to be lifted off my feet the minute I stepped into the reception. However there awaited my first disappointment as we were politely asked to stand in a queue which as I happened to find out while waiting in it for 15 minutes was the queue to check-in! Finally when we were next in line for the reception counter, we were suddenly whisked away by an extremely apologetic front desk staff straight into the VIP lounge. I was still trying to understand, whether they had realised their mistake that we were “Star” guests or they were simply trying to move the queue quickly by diverting some guests into a different section, when I was told again very apologetically, that my room was not ready! It was 3:30 pm, 3:00 pm was the standard check-in time. Now, I’ve worked in the hospitality industry, room not being ready I can understand, it was a busy day and a public holiday in Hong Kong, but I am sure there was a better way for a more organised check-in, instead of harrowed guests being made to stand in queues as if at the train platform! And this was in the Star Tower which had the higher category of rooms as compared to Celebrity Tower! Even the names sound absurd now. ‘Star? !’ Anyway the highly apologetic staff then went on to get some approvals from his manager and offered us complimentary passes for some of their attractions. My boys were tired but it was better to see a show than just wait so we went to see the Batman show. What we did not know was that the show was another endless hour of waiting in yet another queue! No priority given to Star suite guests. Thank goodness the show was good, very good judging by the squeals of delight and laughter coming from both my boys. Unfortunately I am not very good with 3-D shows and started getting a headache soon after. While we were walking back to our hotel I was determined to push back all the unpleasantness and looked forward to our stay. Our room was ready! Yeah! But my happiness lasted only till I used the housephone. Good evening this is Guest services, this is Soandso speaking, how may I assist you? Hi could you please replace the fruits in my fruit basket? Could we have some bananas instead? Sorry could you please repeat? May I get some fruits replaced in the fruit basket? Pause…Ah how may I address you Madam? (one would have expected them to know that from their system screen as I was calling from my room). Ah ah how do you spell that Madame? Ah Mrs. Duren? (Whatever I didn’t bother to correct). Ok Mrs. Duren, I will now transfer your call to our room service department. Is there anything else that I could help you with? (Maybe not since you haven’t helped me with my first request yet). Room service, tadatada here how may I help you? I need some fruits to be replaced in the fruit basket? Would you have some bananas please? What? Ah sorry Madame what do you want? (Again the same old story given in a much slower English). Oh that Madame only house keeping can change. Well then transfer me to house keeping. What!! After 5 minutes of not getting any call back from them I redialed Guest Services as I couldn’t get through to Room service. Again the whole conversation plays out including the ‘How may I address you?’ line which seriously ticked me off this time and I told him/her that it didn’t matter what I was called just as long as I got my request answered. I was put on hold as house keeping wasn’t answering once again and was asked to call back to which I said. “Certainly Madame is there anything else I could help you with?” What!!!! It was only the next day did I realise that this line of conversation was a part of the standard operating procedure for service in the hotel. How may I address you? What else may I help you with? Certainly Madam (for every question asked), just that I was never certain whether they had understood my request in English or not! Well one good thing about these two nights in Studio City was that I got to practice a whole lot of my broken Cantonese! To be fair the property is grand, the rooms spotless, the fittings and toiletries provided are of very good quality, however it’s these small gaps in the service which left us rankled at every turn. “What time does the Golden Reel ride start operations?” “Not sure!” said the gym staff, “Maybe around 10” said the operator, “They are not answering the phone.” We go all the way back to our rooms to collect our passes and then walk to the attraction only to be told it starts at 12! While the concierge staff were very helpful, English was certainly not their strength leaving us both breathless and hopeless by the end of a simple conversation. They did help us with making the restaurant bookings though which was a great achievement. Another nice feature of the property were their indoor and outdoor pools – but again an irritant as they were not interconnected leaving us to robe and disrobe every time we had to go to one from the other. We didn’t face this problem the following day however as they had stopped guests of the hotel from using the outdoor pool completely, as apparently someone had privately booked the whole pool for something! Guests couldn’t even walk along the periphery of the pool, which happened to be one of the very very few outdoor walking areas of the hotel. Well at least we were spared the indoor to outdoor pool and vice versa transfers! Every few hours it was as if a new ‘experience’ was waiting round the corner for us. The complimentary attraction tickets given to us for the Golden Reel ride turned out to be outdated making us do yet another round of a long walk to the concierge and then back to the attraction! Oh and did I mention we were about to board a wrong shuttle bus thanks to the “confidence” of a doorman on where it was headed. Thank goodness we double checked with someone else! Honestly I must mention that the staff are genuinely warm and friendly but what they do lack is product and operations knowledge and good service training. Maybe it is because the hotel is brand new but within just two days of staying there one got a sense of incompleteness as if something important was missing, not a good feeling to have when you’re on a holiday. Finally at the time of check out I called guest services beforehand letting them know that we were checking out and asked them to keep the bills or any other formalities to be completed ready. On reaching the reception area we asked by the concierge to stand in the queue once again just to check-out! After 5 minutes of waiting we were approached by another reception staff and were told that the hotel followed an ‘express check-out’ system and we could just leave. No paper work, no thank you for the stay, no feedback asked, nothing, just go! We walked happily out the doors to get a breath of fresh Macau air!